Find Evidence-based/informed Strategy Measures (ESMs) that are currently in use by states and jurisdictions as well as those that have been completed. You can search by key word (e.g., WIC, hospital), NPM, or state/jurisdiction. Note: the new, updated ESM search form will be released after December 7, 2018 when the most recent data is available nationally. Note: this is a prototype search page. As data is collected, you will be able to link to the peer-reviewed evidence behind each ESM, notes on strengths and limitations of measures, evaluation strategies, and agency contacts to request more information. If you have comments/ideas about this search, please contact us to discuss. Note: checking more items from the drop-downs narrows your search. If your search finds "no records," try another search with fewer boxes checked. 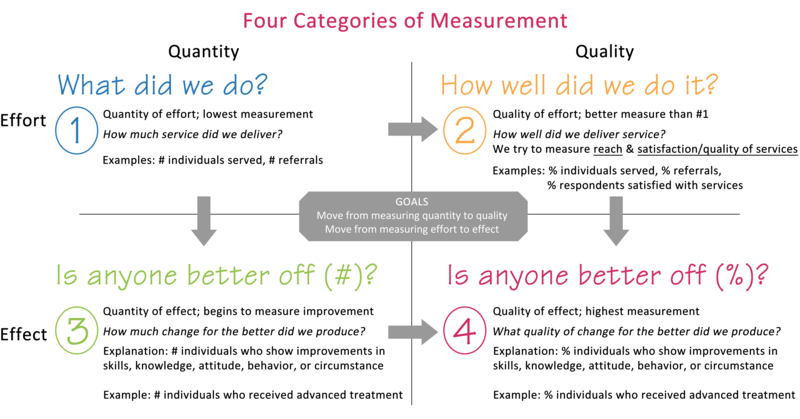 From measuring quantity (#s, such as counts and yes/no) to measuring quality (% reach, satisfaction, or service that meets standards) (lowest measurement is Category 1). From measuring effort (what we did) to measuring effect (how our target audience increased their skills/knowledge, attitude/opinion, or behavior/circumstance). This chart summarizes the differences in measurement. Note: not everyone needs to be measuring all Category 4 ESMs; the most effective measurement combines a mix of categories. ESMs can be categorized based on the levels of the MCH Pyramid. As a field, we are trying to "move down the pyramid" in providing fewer direct services and more enabling and public health systems services. Activities directed to families/children/youth (e.g., Bright Futures or other outreach materials provided to families). Activities directed to professionals (e.g., trainings provided to local staff). Activities related to systems-building (e.g., % of birthing facilities with a Safe Sleep Certification).